I think that VeggieTales is such a great way of teaching kids even more lessons about God and just general values and morals that good people are to have. And also It’s so fun that kids actually enjoy watching and therefore enjoy learning. Their children’s movies always have this good combination of good music and visuals plus a great story that even adults can watch with their kids. 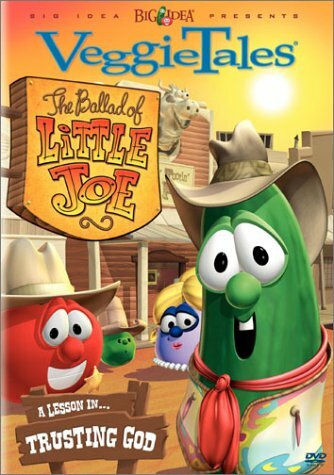 VeggieTales: the ballad of Little Joe is a story about forgiveness. It focuses on Little Joe and how his brothers would always treat him badly and once sold him as a slave. This specific story of this Christian DVD the set out west in the desert near Okie-Dokie corral. The story presented in this Christian movie is basically the story of Joseph from the Bible. In this movie, the audience meets little Joe and he has many talents, for example, he has great problem-solving skills, he knows how to organize and he has the gift of interpreting dreams. At the beginning of this Christian movie, it is Little Joe’s birthday and his father is presenting him with many gifts in trying to make his son feel special in his day. But little Joe wasn’t an only child he had several brothers so this point Joe’s older brothers are jealous of all the attention little Joe is getting. And in that moment they begin to present their brother because their father seems to favor him more. Later on, in this children’s movie, Little Joe has a dream and decides to tell his brothers about it. He says that he dreamed that all of them had bowed down to him and he mentions that this probably will happen one day in future. His brothers are suddenly mad as they hear their little brother continue with his dream. Since they are so maddened by what they’re hearing they choose to teach little Joe a lesson. So one day they take little Joe and leave him inside a pit and later on here sold as a slave to some scallions. What happened to Little Joe? He is taken to a western town ends up working in a saloon for Mr. McPotiphar. He is a valued employee because of all the talents that he has to offer. Alongside Little Joe, we have Miss Kitty whose job is to entertain on stage but when little Joe is crowned employee of the month she gets really jealous as she’s always had that title. She decides to do something and frames Little Joe from VeggieTales: The Ballad of Little Joe for gold theft and because of this, he is sent to prison for a crime that he actually never made. Even though Little Joe from VeggieTales: The Ballad of Little Joe is in jail, he always tries to maintain a positive outlook even though he is in a terrible place. When some of these inmates have dreams little Joe helps them interpret them and the actually come true. The mayor actually hears of little Joe’s talent of interpreting dreams and ask him to help interpret one of his dreams. The mayor’s dream involved seven fat cows eating seven thin cows. Little Joe warns the mayor that there’s going to be a famine in the land but before that there’ll be seven years of abundance so the people have to prepare before the famine gets there. The mayor actually believes little Joe and his interpretation and puts him in charge of handing out resources during the famine. As the famine arrives and he continues to give out resources Little Joe recognizes his brothers looking for provisions. At first, they don’t recognize him and little Joe really wants to tell them who he is but first he has to know that they have fully changed. So he frames the youngest brother Benjamin for theft and waits to see how the older brothers react. Evidently, all the brothers try to go in Benjamin’s place and immediately mention how they’ve regretted what they did to Little Joe from the Christian movie VeggieTales: The Ballad of Little Joe beforehand. In this moment little Joe reveals himself and his brothers are so happy to see him and apologize greatly for what they did. Little Joe sees that they’re truly remorseful and accepts their apology.